I am constantly asked for recommendations for products from webinar attendees and even through e-mails. These range from reference guides to entire payroll systems. Normally I never recommend products or books or really anything including payroll systems and software. Why don’t I you might ask? Its very simple… I am not paid to do so, so why should I. That sounds harsh I know. But I also think it kind of cheapens a recommendation when it is given if that person constantly keeps recommending everything from soup to nuts because they are paid to do so. Though the money would be nice, if I am being honest, but no one has approached me with a check to recommend their product or book or system so I don’t, it’s that simple. Even with that in mind, there is one area that I am asked repeatedly for the same recommendation. This area is California wage and hour law. I am constantly asked by webinar attendees and others if I know of a good, reliable source on California wage and hour law. Especially lately because of the the new sick leave law that is now effective. The answer is always, yes I do. So I am going to break one of my little rules and make a recommendation for this one topic…free of charge. 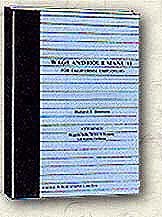 For a top-notch reference on California wage and hour law I recommend the Wage and Hour Manual for California Employers by Richard J. Simmons. The 18th edition has just come out which covers the new California sick leave law and I have already bought my copy (I paid full price like everyone else). I have used this manual since the early 90s and it has been a staple in my reference library. If I get a question on California wage and hour law it is the one source I go to. For full disclosure I do know Richard Simmons on a first name basis to say hello to but that is all. We have served as speakers for the same conferences and I attend his personal wage and hour law seminars every couple of years to update my knowledge on this difficult subject. But he has never approached me for a recommendation on his books. I just use them and I want to pass this along to other payroll professionals who may need a reference guide in this area.